A whole grain, also called a wholegrain, is a grain of any cereal and pseudocereal that contains the endosperm, germ, and bran, in contrast to refined grains, which retain only the endosperm. As part of a general healthy diet, consumption of whole grains is associated with lower risk of several diseases. Whole grains are a source of carbohydrates, multiple nutrients and dietary fiber. Cereals proteins have low quality, due to deficiencies in essential amino acids, mainly lysine. In contrast, the proteins of the pseudocereals have a high nutritional value. In a small part of the general population, gluten – proteins found in wheat and related grains – can trigger coeliac disease, non-coeliac gluten sensitivity, gluten ataxia and dermatitis herpetiformis. Whole grains are a source of multiple nutrients and dietary fiber, recommended for children and adults in several daily servings containing a variety of foods that meet whole grain-rich criteria. By supplying high dietary fiber content, as part of a general healthy diet, consumption of whole grains is associated with lower risk of several diseases, including coronary heart disease, stroke, cancer and type 2 diabetes, with lower all-cause mortality. Regular whole-grain consumption lowers LDL and triglyceride levels, which contributes to an overall 26% reduction in coronary heart disease-risk factors. In addition, whole-grain consumption is inversely related to hypertension, diabetes, and obesity when compared to refined grains, all of which are negative indicators in total cardiovascular health. As components of breakfast cereals, whole grains are associated with improved micronutrient intake and lower risk of several diseases. Their effects on gastrointestinal health, risk of obesity and cognition need further evaluation. Keeping grains as close to their original form as possible slows or prevents the digestion of starch, and a slower digestion is responsible for preventing spikes in blood sugar (over time spikes in blood sugar may lead to insulin resistance). Cereals proteins have low quality, due to deficiencies in essential amino acids, mainly lysine. Supplementation of cereals with proteins from other food sources (mainly legumes) is commonly used to compensate for this deficiency, since the limitation of a single essential amino acid causes the others to break down and become excreted, which is especially important during the period of growth. In contrast, the proteins of the pseudocereals have a high nutritional value, close to those of casein (the main protein in milk). Quinoa and amaranth are the most nutritious grains due to their high content and quality of proteins, with high levels of lysine and other essential amino acids. Minor cereals and pseudocereals are a good alternative to replace gluten-containing cereals, for people who need to follow a gluten-free diet. Manufacturers of foods containing whole grains in specified amounts are allowed a health claim for marketing purposes in the United States, stating: "low fat diets rich in fiber-containing grain products, fruits, and vegetables may reduce the risk of some types of cancer, a disease associated with many factors" and "diets low in saturated fat and cholesterol and rich in fruits, vegetables, and grain products that contain some types of dietary fiber, particularly soluble fiber, may reduce the risk of heart disease, a disease associated with many factors". The scientific opinion of the European Food Safety Authority (EFSA) related to health claims on gut health/bowel function, weight control, blood glucose/insulin levels, weight management, blood cholesterol, satiety, glycaemic index, digestive function and cardiovascular health is "that the food constituent, whole grain, (...) is not sufficiently characterised in relation to the claimed health effects" and "that a cause and effect relationship cannot be established between the consumption of whole grain and the claimed effects considered in this opinion." In genetically susceptible people, gluten (proteins found in wheat, barley, rye, oat, and related species and hybrids) can trigger coeliac disease. Coeliac disease affects about 1% of the general population in developed countries. There is evidence that most cases remain undiagnosed and untreated. The only known effective treatment is a strict lifelong gluten-free diet. While coeliac disease is caused by a reaction to wheat proteins, it is not the same as a wheat allergy. Other diseases triggered by eating gluten are non-coeliac gluten sensitivity, (estimated to affect 0.5% to 13% of the general population), gluten ataxia and dermatitis herpetiformis. In the United States wholegrain products can be identified by the ingredients list. "Wheat flour" (as opposed to "wholegrain wheat flour" or "whole-wheat flour") as the first ingredient is not a clear indicator of the product's wholegrain content. If two ingredients are listed as grain products but only the second is listed as wholegrain, the entire product may contain between 1% and 49% wholegrain. Many breads are colored brown (often with molasses or caramel color) and made to look like wholegrain when they are not. In addition, some food manufacturers make foods with wholegrain ingredients, but, because wholegrain ingredients are not the dominant ingredient, they are not wholegrain products. Contrary to popular belief, wholegrains are not indicative of fiber. The amount of fiber varies from grain to grain, and some products may have things like bran, peas, or other foods added to boost the fiber content. In Canada, it is legal to advertise any food product as "whole wheat" with up to 70% of the germ removed. [dubious – discuss] While the resulting product will contain the benefit of fiber in the nutritional information, it lacks the nutritional content found in the wheat germ. Canadian consumers can be assured of whole-grain products by a label stating 100% whole-grain whole wheat. From AACC (American Association of Cereal Chemists) definition: "Whole grains shall consist of the intact, ground, cracked or flaked caryopsis, whose principal anatomical components - the starchy endosperm, germ and bran - are present in the same relative proportions as they exist in the intact caryopsis." There are multiple grains such as cereal grains (e.g. 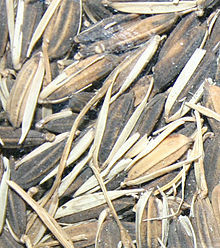 wheat, rice, oats, barley, corn, wild rice, and rye) as well as pseudocereals (e.g. quinoa and buckwheat) that may be labeled whole grains. When wheat is milled to make flour, the parts of the grain are usually separated and then are recombined to make specific types of flour, such as whole wheat, whole grain, white cake and pastry flour, and all-purpose white flour. If all parts of the kernel are used in the same relative proportions as they exist in the original kernel, then the flour is considered whole grain. Under the Food and Drug Regulations, up to 5% of the kernel can be removed to help reduce rancidity and prolong the shelf life of whole-wheat flour. The portion of the kernel that is removed for this purpose contains much of the germ and some of the bran. If this portion of the kernel has been removed, the flour would no longer be considered whole grain. In the UK the legally protected term is wholemeal rather than wholegrain. There are voluntary guidelines on what can be labelled a wholegrain product. ^ a b European Commission in the Communities 6th Framework Programme, Integrated Project HEALTHGRAIN (2013). "Whole grain definition" (PDF). Retrieved 3 June 2017. ^ "Whole Grains". AACC. Retrieved 3 June 2017. ^ van der Kamp, JW (2013). "Whole Grain Definition: New Perspectives for Inclusion of Grains and Processing but not for Analysis" (PDF). Cfw Plexus. doi:10.1094/CPLEX-2013-1001-08B. Retrieved 3 June 2017. ^ a b "Whole Grains and Fiber". American Heart Association. 2016. Retrieved 1 December 2016. Dietary fiber from whole grains, as part of an overall healthy diet, may help improve blood cholesterol levels, and lower risk of heart disease, stroke, obesity and type 2 diabetes. ^ a b c "Whole Grain Fact Sheet". European Food Information Council. 1 January 2009. Retrieved 6 December 2016. ^ a b "Whole Grain Resource for the National School Lunch and School Breakfast Programs: A Guide to Meeting the Whole Grain-Rich Criteria" (PDF). US Department of Agriculture, Food and Nutrition Service. January 2014. Additionally, menu planners are encouraged to serve a variety of foods that meet whole grain-rich criteria and may not serve the same product every day to count for the HUSSC whole grain-rich criteria. ^ a b "All About the Grains Group". US Department of Agriculture, MyPlate. 2016. Retrieved 6 December 2016. ^ a b Shewry, PR. "Impacts of agriculture on human health and nutrition – Vol. II - Improving the Protein Content and Quality of Temperate Cereals: Wheat, Barley and Rye" (PDF). UNESCO - Encyclopedia Life Support Systems (UNESCO-EOLSS). Retrieved 2 June 2017. When compared with the WHO requirements of essential amino acids for humans, wheat, barley and rye are seen to be deficient in lysine, with threonine being the second limiting amino acid (Table 1). ^ a b c "Nutritional quality of cereals". Food and Agriculture Organization of the United Nations. Retrieved 1 June 2017. ^ a b c d e Saturni L, Ferretti G, Bacchetti T (2010). "The gluten-free diet: safety and nutritional quality". Nutrients (Review). 2 (1): 16–34. doi:10.3390/nu2010016. PMC 3257612. PMID 22253989. ^ a b Biesiekierski JR (2017). "What is gluten?". J Gastroenterol Hepatol (Review). 32 Suppl 1: 78–81. doi:10.1111/jgh.13703. PMID 28244676. Similar proteins to the gliadin found in wheat exist as secalin in rye, hordein in barley, and avenins in oats and are collectively referred to as “gluten.” The gluten found in all of these grains has been identified as the component capable of triggering the immune-mediated disorder, coeliac disease. ^ a b c Ludvigsson JF, Leffler DA, Bai JC, Biagi F, Fasano A, Green PH, Hadjivassiliou M, Kaukinen K, Kelly CP, Leonard JN, Lundin KE, Murray JA, Sanders DS, Walker MM, Zingone F, Ciacci C (January 2013). "The Oslo definitions for coeliac disease and related terms". Gut. 62 (1): 43–52. doi:10.1136/gutjnl-2011-301346. PMC 3440559. PMID 22345659. ^ Aune, D; Keum, N; Giovannucci, E; Fadnes, L. T.; Boffetta, P; Greenwood, D. C.; Tonstad, S; Vatten, L. J.; Riboli, E; Norat, T (2016). "Whole grain consumption and risk of cardiovascular disease, cancer, and all cause and cause specific mortality: Systematic review and dose-response meta-analysis of prospective studies". BMJ. 353: i2716. doi:10.1136/bmj.i2716. PMC 4908315. PMID 27301975. ^ a b Williams, P. G. (2014). "The benefits of breakfast cereal consumption: A systematic review of the evidence base". Advances in Nutrition. 5 (5): 636S–673S. doi:10.3945/an.114.006247. PMC 4188247. PMID 25225349. ^ Anderson, JW; Hanna, TJ; Peng, X; Kryscio, RJ (June 2000). "Whole Grain Foods and Heart Disease Risk". Journal of the American College of Nutrition. 19 (3 Suppl): 291S–299S. doi:10.1080/07315724.2000.10718963. PMID 10875600. ^ de Munter, Jeroen S. L.; Hu, Frank B.; Spiegelman, Donna; Franz, Mary; van Dam, Rob M. (2007-08-01). "Whole grain, bran, and germ intake and risk of type 2 diabetes: a prospective cohort study and systematic review". PLOS Medicine. 4 (8): e261. doi:10.1371/journal.pmed.0040261. ISSN 1549-1676. PMC 1952203. PMID 17760498. ^ Priebe, M. G.; McMonagle, J. R. (2016). "Effects of Ready-to-Eat-Cereals on Key Nutritional and Health Outcomes: A Systematic Review". PLoS ONE. 11 (10): e0164931. Bibcode:2016PLoSO..1164931P. doi:10.1371/journal.pone.0164931. PMC 5066953. PMID 27749919. ^ "Glycemic Index – From Research to Nutrition Recommendations?" (PDF). Retrieved 2007-07-09. ^ "Health Claim Notification for Whole Grain Foods". Bethesda, MD: Food and Drug Administration, US Department of Health and Human Services. July 1999. Retrieved 4 December 2016. ^ "Guidance for Industry: A Food Labeling Guide (11. Appendix C: Health Claims)". Bethesda, MD: Food and Drug Administration, US Department of Health and Human Services. January 2013. ^ a b c d e "Celiac disease". World Gastroenterology Organisation Global Guidelines. July 2016. Retrieved 7 December 2016. ^ a b c "Definition and Facts for Celiac Disease". The National Institute of Diabetes and Digestive and Kidney Diseases, National Institutes of Health, US Department of Health and Human Services, Bethesda, MD. 2016. Retrieved 5 December 2016. ^ Molina-Infante J, Santolaria S, Sanders DS, Fernández-Bañares F (May 2015). "Systematic review: noncoeliac gluten sensitivity". Aliment Pharmacol Ther. 41 (9): 807–20. doi:10.1111/apt.13155. PMID 25753138. ^ "Whole Grains Council - Intro to Whole Grains". Retrieved 2007-10-10. ^ "Whole Grains Council - Identifying Whole Grain Products". Retrieved 2008-02-10. ^ Schwartz, Rosie. "A wholegrain of truth". Retrieved 2007-05-01. ^ "21 CFR 136". Archived from the original on 2007-12-21. Retrieved 2008-02-10. ^ "21 CFR 137". Archived from the original on 2007-11-02. Retrieved 2008-02-10. ^ "21 CFR 139". Archived from the original on 2007-11-02. Retrieved 2008-02-10. ^ "Whole Grains - Get the Facts". hc-sc.gc.ca. 2007-06-29. Retrieved 17 May 2015. This page was last edited on 26 January 2019, at 21:18 (UTC).